If you must have round headlights and a seven-slot grille, Jeep now offers three ways to get your fix. 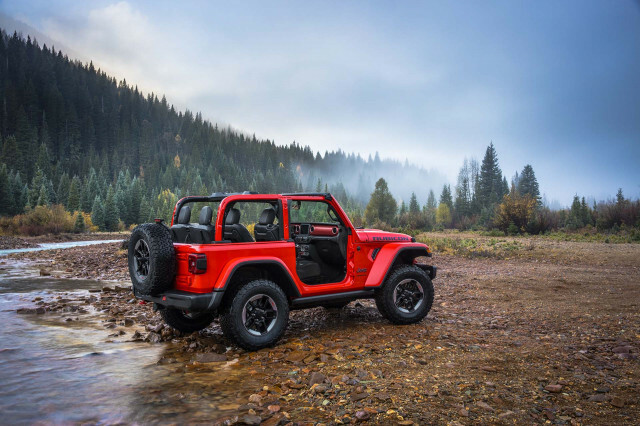 The 2019 Jeep Wrangler is offered in short- and long-wheelbase configurations with two or four side doors. 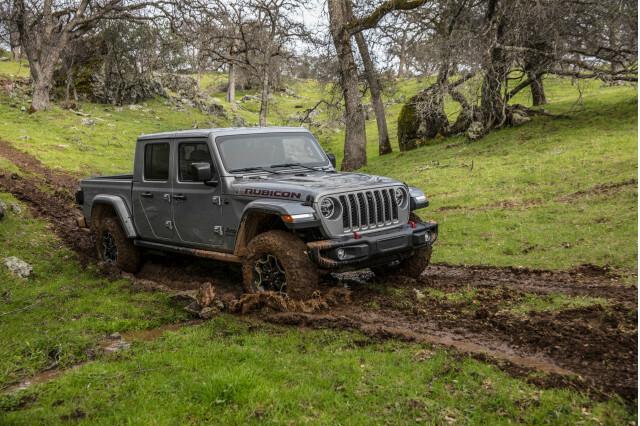 The new 2020 Jeep Gladiator joins the automaker’s showrooms as much more than just a four-door Wrangler with a bed. Overall, we rate both trucks at 5.2 out of 10. There’s much more to these two Jeeps than their shared rating and styling, however. 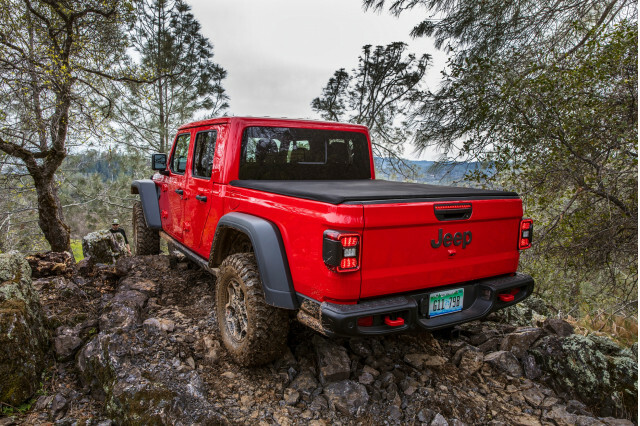 Behind that iconic Jeep grille—which has slightly wider vents for better cooling in the Gladiator—they share a standard 285-horsepower 3.6-liter V-6. In every trim level, the engine comes standard with a 6-speed manual transmission and offers an 8-speed automatic transmission as an option. In either truck, the engine is smooth and refined, but it requires a lot of revving to make the most of what’s underhood. The 8-speed automatic’s extra cogs and quick shifts make it a better pair than the manual, though we don’t fault Jeep for offering two choices. The Wrangler can be ordered with a slick turbo-4 teamed to the 8-speed automatic transmission that uses a mild-hybrid system to save fuel. That engine isn’t available on the Gladiator. 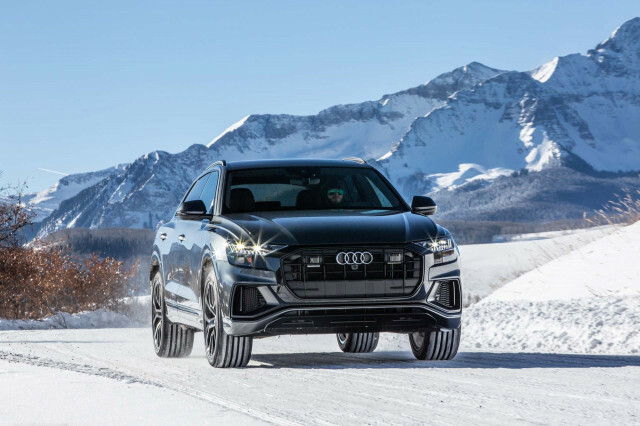 Both trucks eventually will be available with a 3.0-liter turbodiesel that should be even thriftier, though we haven’t driven that engine in a Wrangler or a Gladiator yet. 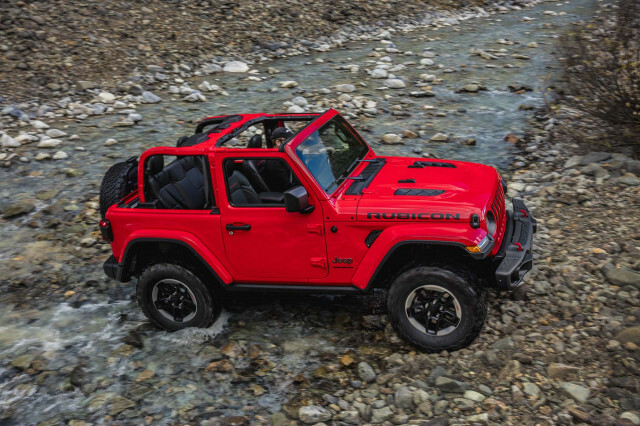 No Jeep is especially thrifty, but the Wrangler's turbo-4 is rated as high as 24 mpg combined compared to just 19 mpg combined for the the Gladiator. Underneath, the two Jeeps have a separate ladder frame and solid axles suspended by coil springs. The Wrangler’s wheelbase stretches from 96.8 to 118.4 inches between two- and four-door models. The Gladiator’s wheelbase is 137.3 inches and its frame is 19 inches longer than the Wrangler’s behind the rear axle due to its 5-foot pickup bed. Wrangler Sport and Sahara trims feature lighter-duty axles; the Wrangler Rubicon and all versions of the Gladiator make use of beefy Dana 44 axles front and rear. In the Gladiator, the front axle’s walls are about 10 mm thicker than those in the Wrangler, too. That extra axle heft helps the Gladiator tow up to 7,650 pounds, but that rating applies only to the Gladiator Sport with the automatic and an extra-cost towing package. Most Gladiators are rated to tow between 4,500 and 6,000 pounds. The Wrangler is rated to lug 3,500 pounds regardless of engine, transmission, or wheelbase. Neither truck delivers a glassy smooth ride. Two-door Wranglers are downright choppy, though four-door models are smoother. The Gladiator isn’t significantly plusher, perhaps because of its beefed-up axles underneath. Both Jeeps require a lot of steering correction at highway speeds thanks to play inherent to their solid axles and their tall, wind-catching shapes. Off-road, what truck works best will depend on where you plan to take it. The two-door Wrangler’s trim proportions mean it can scuttle up narrow trails, such as those once traversed by mining carts. The four-door Wrangler is more stable on challenging moguls and high-speed dune-bashing, but its 188.4-inch overall length is up nearly two feet on the two-door, so switchbacks may require multiple tries. The Wrangler Gladiator measures 218 inches from bumper to bumper and there’s more to its capability than just its overall length. The Gladiator’s rear overhang is considerably longer than the Wrangler’s, which ratchets its departure angle down from 37 to just 26 degrees in Rubicon guise. Accordingly, Jeep fits Gladiator Rubicons with a pair of rock sliders on its rear bumper corners to protect it from a costly boo-boo. Regardless of what’s behind the rear seats, Rubicon versions of the two trucks are fitted with the best four-wheeling tech: locking front and rear differentials, automatic sway bar disconnects, 33-inch off-road tires, and a special four-wheel-drive transfer case with a better crawl ratio for loping along over rocks. From the driver’s seat, all three versions of Jeep’s four-wheeler look the same. 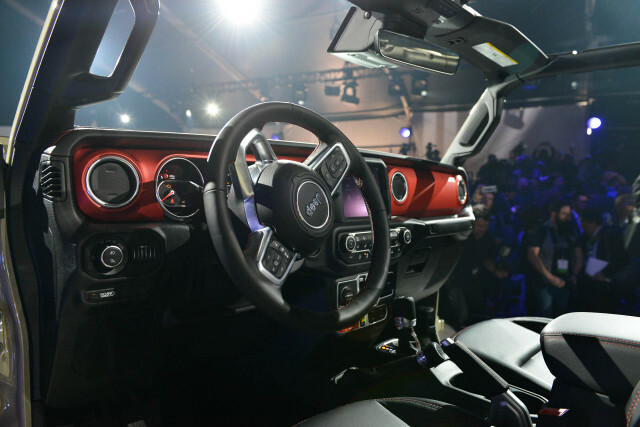 They share a dashboard design, windshield that folds flat, and compromised seating position. They feel narrower than they are thanks to a transmission tunnel that carves into front-seat leg room. A height-adjustable driver’s seat is standard on all, but don’t look for power adjustment or a multi-configurable passenger’s seat even on the relatively tony Wrangler Sahara and Gladiator Overland trim levels. If you regularly carry more than one passenger, bypass the two-door Wrangler. Its rear seat is best for occasional use. Four-door Wranglers have narrow door openings made even more challenging by the rear fender flares. Once aboard, passengers will find 38.3 inches of rear-seat leg room, but it feels like a lot less. The Gladiator’s rear doors are the same as those on the four-door Wrangler, but its rear fenders don’t get in the way. On paper, the truck has the same rear leg room as the Wrangler, but there’s more usable space in the pickup. It’s hard to compare the three Jeeps when it comes to cargo utility. The Gladiator’s bed offers about 35 cubic feet of space and can be ordered with a bedliner or a retractable cover. Wranglers have as much as 72 cubic feet of cargo space with the rear seat folded. The Gladiator tantalizes with its pickup truck utility and retro-cool shape. For many buyers, that alone will be worth the roughly $2,000 price premium over the Wrangler. We have sent your request for price quotes on the 2019 Jeep Wrangler and 2020 Jeep Gladiator to the dealers you requested. They should be in touch shortly. 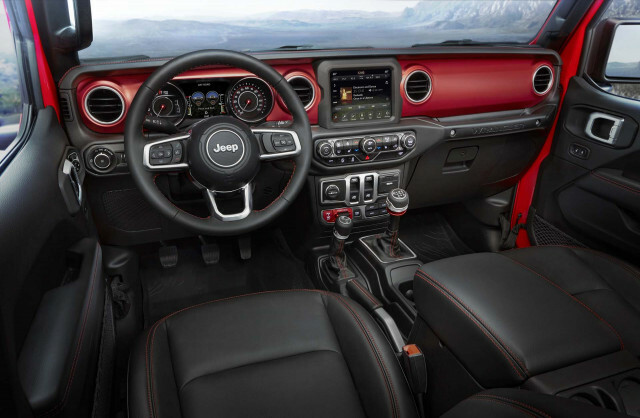 Your request for a fast, free price quote on a 2019 Jeep Wrangler and 2020 Jeep Gladiator is in process. The CarsDirect Dealer(s) listed below will contact you shortly to discuss your request and to provide a quote.